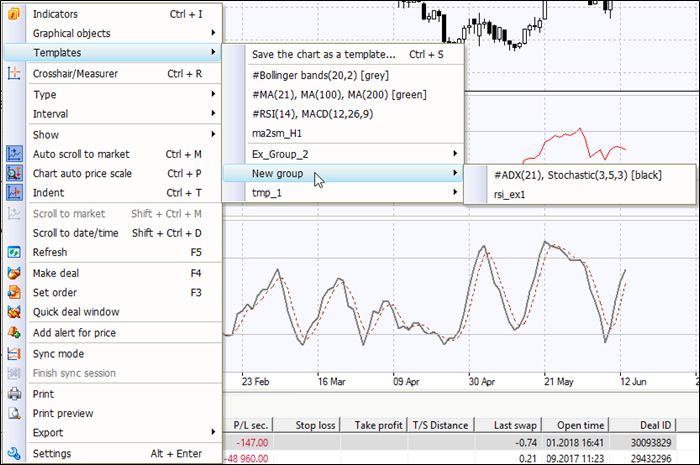 To work with chart templates right-click on the active chart window and choose the "Templates" in the opened context window. 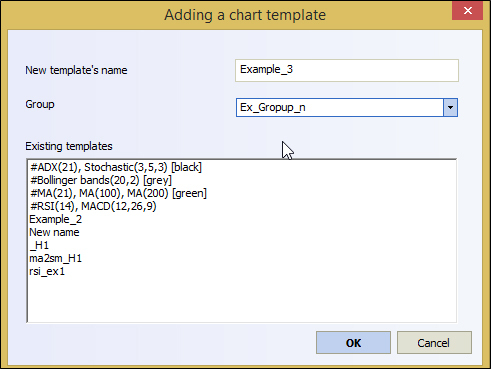 a)Left-click on "Save the chart as a template ..." to open a dialog box "Adding a chart template", type in template name in the opened window, and also in the group of templates, if necessary, and press "OK" to save the template.You can add a new template to the existing group or create a new group or not add it to any group. b)In case of choosing the template name from the list by the left-click, the current chart will accept all the template settings including indicators and graphical objects. 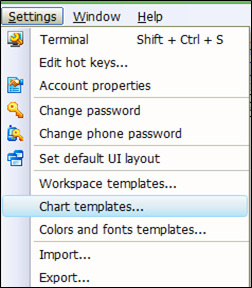 To export chart templates open "Settings" tab in the main menu and choose the "Export..." option in the opened window. Then, in the "Export settings" dialog box you may tick the settings you need to export. 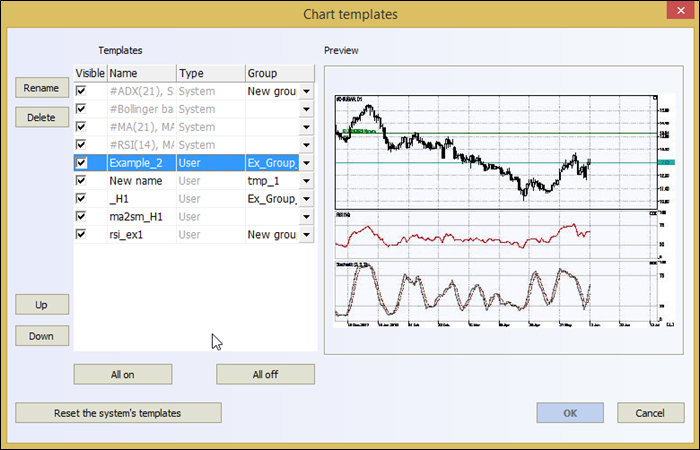 In the example all chart templates are chosen for the export. You may write a file with "tte" extension of the chosen templates on your CD after pressing the Export button. 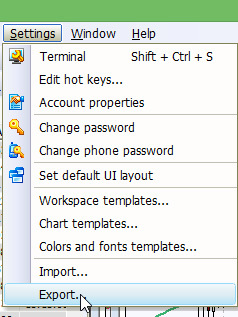 In the opened dialog box it is necessary to mark the template to be deleted and press the "Delete" button, then "Yes" and "OK" to close the window. Additionally, in this dialog box you may set the visibility of the templates in the list of terminal templates, move the template up or down on the list. In the column "Group" you can add the template to any group, or remove the template from all groups. 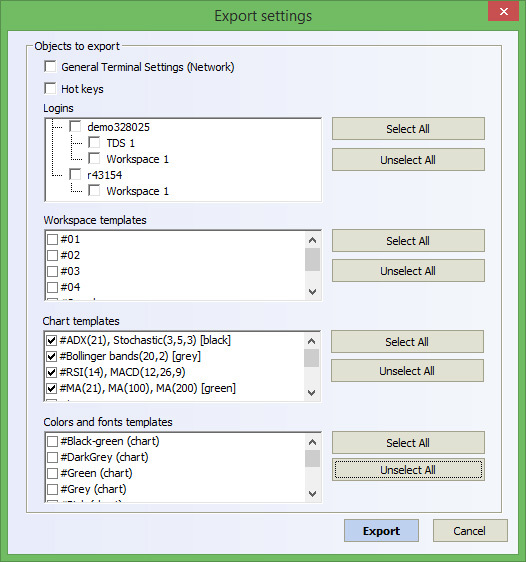 Besides templates created by user, you may use the system templates - the terminal has four system templates which serve as examples of possible chart settings and cannot be deleted.